If you suffer from gas, bloating, constipation, diarrhea, acid reflux, or other digestive problems, you don’t need us to tell you that your gut needs attention. But did you know that gut health is also a major factor in autoimmune diseases (e.g. Hashimoto’s, rheumatoid arthritis, multiple sclerosis), depression, skin problems, low energy, hormone imbalance, and virtually every other modern, chronic health problem? This is why we pay close attention to the gut in every client. Gut infections, changes in the gut microbiome, and “leaky gut” contribute to inflammation and chronic illness and optimizing gut health is an emphasis in my practice. In many cases autoimmune conditions can go into remission with specific changes to diet and lifestyle. Is just in its infancy! When most people think about eating healthy, they automatically visualize fruits and veggies. Have you ever thought: "If I eat 'right' I might feel a little better and then, maybe, just maybe, I might play my cards right and prevent a few diseases down the road?" Nutrition is much more powerful than that. Epigenetics is a relatively new field that is discovering that proper nutrition is not just a powerful preventative tool, it can reverse disease states as well. As we learn more about the powerful way our diets influence our genetic expression towards health or disease, in the near future personalized medicine with the focus on nutrition will become the first line of therapy. 90-Minute Initial Consultation - Are you ready to have a health practitioner really get to know you as a person and not just your numbers? This comprehensive session gives us the time you deserve to review your Personal Health Assessment and thoroughly discuss what health goals are important to you this very moment. Based off of our conversation, we will determine the next steps that will get you towards the results you want. We will determine which one best fits your needs at the end of this appointment. Personal Health Assessment - This expansive questionnaire is a full analysis of your current eating, exercise and sleep habits, your relationship with food, stress levels, potential sources of toxic exposure, digestive health and much more! Medical Symptoms Questionnaire - Start off knowing exactly how your body is feeling based off of a numerical score. You will track your progress throughout your membership by completing the questionnaire again and discover how much better your body is feeling! 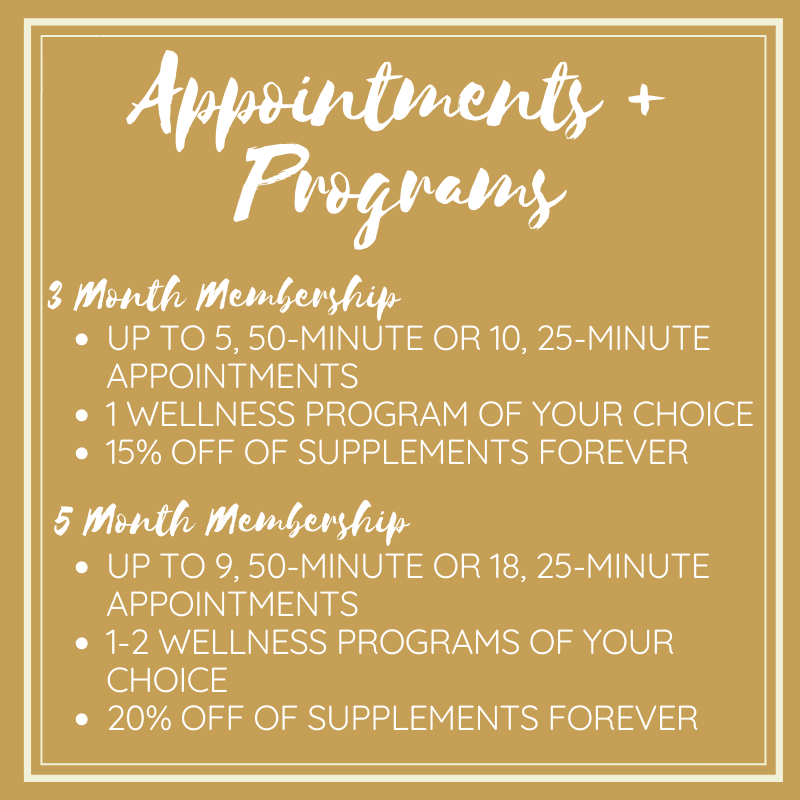 Ongoing Appointments - Each month, you’ll have 1 or ideally 2, 50-minute one-on-one appointments (you can also increase your appointment frequency with 25-minute appointments). Our ongoing sessions provide you with accountability, support, guidance and inspiration. There will be time to answer your burning questions, discuss your progress towards your health goals, help you develop a realistic plan to help you overcome current or future challenges and we can also use this time to go grocery shopping or clean out your kitchen! Individualized Nutrient Recommendations + Access to Pharmaceutical-Grade Supplements + a Lifetime 15-20% Discount! - Did you know over-the-counter supplements use artificial and poorly absorbed forms of vitamins and minerals, have unnecessary colorants and fillers, contain GMOs and are not regulated by the FDA? Have confidence knowing you are getting the highest quality supplements by using Thrive Nutrition's online pharmaceutical-grade supplement dispensary: Fullscript. Pharmaceutical-grade supplements are third party tested for purity and potency. Their raw materials are tested for contaminants, heavy metals, pesticides, environmental pollutants and suppliers undergo rigorous qualification procedures and audits. The supplements offer therapeutic levels of ingredients, have proper nutrient forms and ratios and are manufactured in temperature, humidity and dust-controlled rooms. Lab Result Interpretations - Curious about your micronutrient, inflammation, heavy metal levels or wondering about your thyroid, heart or gut health? We do functional medicine based testing to help you live your healthiest life. We offer the most advanced testing at reasonable pricing and spend time reviewing your results with you. Learn more about all of the tests we offer. Food List & Recipes - Start each program with delicious food: each program (minus Healing Emotional Eating program) offers a complete food list and at least 2 weeks worth of recipes. You can pick and choose from recipes that please your palate. WHOLE30 COACHING PROGRAM - 3 Month Membership Recommendation - Have you always been curious about trying the Whole30 challenge, but didn't think you could do it alone? Well now you don't have to! At Thrive Nutrition, we help you get prepared and organized, support you through the challenge (provide recipes, resources and cheer you on! ), and at the end, assist with food reintroduction. The Whole30 is, at its heart, an elimination diet. Just a small amount of any of inflammatory foods could break the healing cycle; promoting cravings, messing with blood sugar, disrupting the integrity of your digestive tract, and (most important) firing up the immune system. Anyone can benefit from trying this! INTRO TO HEALTHY EATING FOR FAMILIES PROGRAM - 3 Month Membership Recommendation - Everyone wants their family to be healthy, but it isn't always easy! We work with parents to learn what healthy eating looks like and how to get their kids excited and engaged with healthy food. We teach parents tips on how to plan and cook healthy meals, suggest kid-friendly snacks and how to make family dinners more fun. We also help parents explore potential food eliminations if members of the family are showing food sensitivities. PRENATAL NUTRITION: FERTILITY + NOURISHED PREGNANCY PROGRAM - Either Membership Recommendation - Think of your pre-fertility year as an amazing opportunity to improve your overall health and well-being. Now is the time to focus on you, reset, identify and address underlying health issues and find your highest expression of balance. There is no better way to head into pregnancy than that. If you are pregnant, it's never too late to learn the foods to eat to best support your growing baby. This program provides supplement advice, special pregnancy foods, simple recipes, pregnancy/birth tips and helpful books to guide you have your best pregnancy! NOT SEEING WHAT YOU NEED? Hey, no problem! We can come up with something you're looking for! *Each client protocol is unique to their health and wellness status. HSA/FSAs can be used for supplements and testing. TO SEE IF THRIVE NUTRITION IS RIGHT FOR YOU, BOOK A COMPLIMENTARY 30-MINUTE PHONE CONSULT. SIMPLY SELECT A TIME IN THE ONLINE SCHEDULER THAT WORK BEST FOR YOU. HEALTH COACHING - We offer 3 Month Health Coaching Memberships. You start with a 45-minute phone appointment reviewing your Personal Health Assessment and then have up to 10 additional 25-minute check in calls tailored to your health goals. Payment options are 1 payment for $400 or 3 payments of $145. LAB TESTING - $50-100 + cost of the lab test(s) - Thrive Nutrition provides state-of-the-art lab testing that assesses a spectrum of risk factors and biomarkers for optimum wellness. If you're not a client, but want to learn some things about what's going on inside your body, Thrive Nutrition will order the tests you're interested in and discuss your results in a 30-minute phone appointment. 90 MINUTE INITIAL CONSULTATIONS - 90 minutes - $200 - Available in person or via phone or video conferencing. Includes reviewing your Personal Health Assessment. CHECK-IN APPOINTMENTS - 25 minutes - $50 - Stay on track with convenient check-in calls. May be purchased individually according to your needs.